Presentation matters when it comes to landing the right job. You can fully expect employers to judge your 'book' by its cover, so if you want them to keep reading, you need to create an attractive 'cover' that draws them in. Confused by the multitude of options and advice on resume presentation? Our professional Word resume templates guide you through the process and help you shape your information into a sleek, readable document. Using a high-quality template allows you to tailor your resume to a particular employer. At the same time, a template makes it easier to stay consistent with your style and visual presentation. You can also choose from a wide variety of templates and select the most appropriate one for your industry and type of employer. 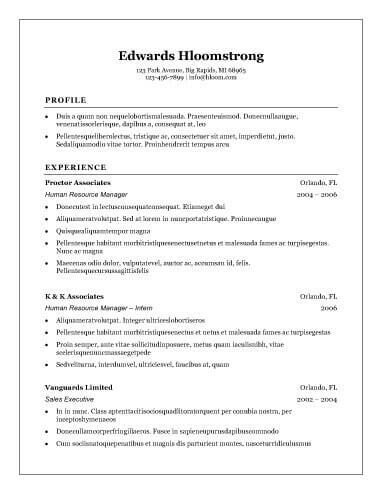 Why Use Professional Word Resume Templates? Each field has its own specific demands and expectations from jobseekers. Some industries prioritize expressions of creativity and individuality, while others want to see no-frills, informative resumes. Many jobseekers feel stymied in the face of the various methods of resume composition. Use your knowledge of your qualifications and of your prospective employer’s expectations to select the correct format type. Sometimes, you just need a simple, minimal resume with no extras to distract the employer. In such situations, look at templates with clean design and with only the types of headers you need. A basic and simple resume template makes good use of white space in separating information and facilitating quick reading. Section headings and bullet points further streamline this template’s organization. When you bring a non-traditional job history to the table, you may need a non-traditional resume to convey your qualifications. A functional resume focuses on specific relevant skills, achievements, and experiences rather than relaying a chronological work history. Our functional professional Word resume templates guide you through the steps of creating an effective functional resume. Recent graduates searching for entry-level positions often face the issue of not knowing how to fill up a resume. We have created professional Word resume templates geared toward applicants who begin their job search without extensive experience. This template helps you pull out and organize relevant skills and experiences from coursework, volunteering, and part-time jobs. Most people know a classic when they see one. This resume template works across many industries and position types. The clean-cut design draws attention to the content rather than to itself, while the chronological organization provides a smooth reading experience. Whatever stage of your career this job search represents, a classic template lets your accomplishments shine. Creative professionals often have a different metric for career achievement than those in more traditional fields. Our creative professional Word resume templates let you organize accomplishments such as showings or performances. You may also need to include sections on awards or production credits. We provide a range of designs, from the classically streamlined to the innovative and graphic. Provide your full name, a professional-sounding email address, a current phone number, and a mailing address. For some positions, it can make sense to include links to a relevant professional profile. Make sure the phone number you include has its voicemail box properly set up, with an appropriate greeting message. Most applicants only need a summary statement, which should succinctly draw attention to the most important reasons an employer will benefit from hiring you. These may include top skills, outstanding achievements, and professional awards. Use an objective if you think employers may legitimately wonder why you want this job; for example, if you want to drastically change your career path. This section should present a brief list of about six of your most relevant and important skills. Use your knowledge of your industry as well as the employer’s job description to understand which skills to prioritize. For most jobseekers, this means creating a reverse chronological list of positions, beginning with your current or most recent one. For each position, list the employer, its location, your job title, and the dates of your employment. Follow this information with a bullet-pointed list of major responsibilities and accomplishments. Specific metrics, such as sales numbers, can go a long way towards convincing employers of your qualifications. List degrees and relevant certifications, along with the name and location of the granting institution as well as completion dates. Recent graduates may wish to include a slightly higher level of detail, such as relevant coursework, academic honors, and relevant clubs or activities. If you want more detailed guidance on producing a stellar resume, a good resume builder can help you achieve results. Check out our helpful resume builder that can aid you in getting the most out of our professional Word resume templates. Remember to review your document carefully before submitting it. While good resume tools can help you with a substantial portion of the work, you want to ensure your resume’s tone and content truly reflect your own personality and accomplishments.